My name is Lynn Zelda Davis, a 21 year-old Texan college student currently working on their bachelor's degree in English Education. That's right, folks, history and cartography are just a side hobby for my real, crazy passion: teaching! Other than that, I love to write, to read, and just about everything involving Christmas. My favorite things in life are my partner Chris, my maps, and sleep. Most people around the web know me as ToixStory (formerly known as PlatoonSgt). Sometime around 2010 I started to wonder about the usual history scenarios, about what would have happened if the Nazis had won, if Texas was still independent, etc., and found AlternateHistory.com that same year, which only fueled my passion. At the same time, I was becoming more and more interested in history itself, devouring every book I could find on any part of history, which only fueled my desire for alternate history. This past year has seen it really ramp up in terms of research and study, but the passion has been there for a while now. 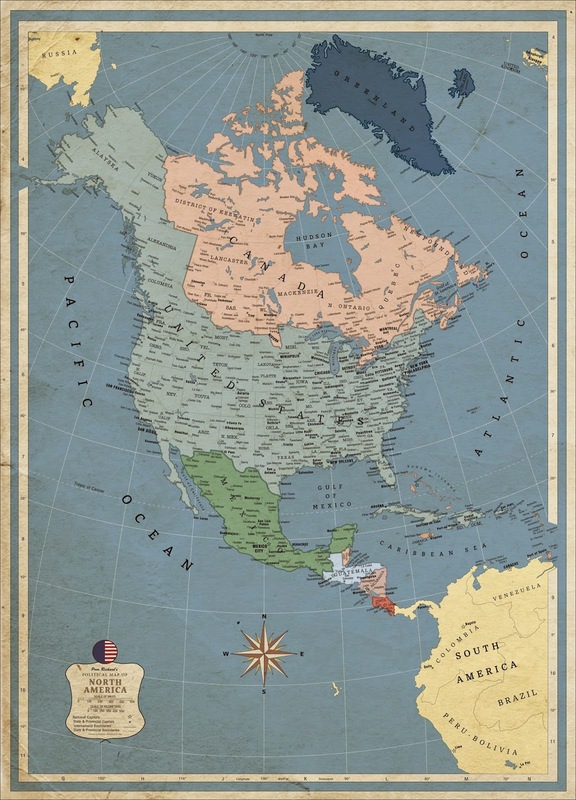 When did you start creating alternate history maps? Technically, I got started around 2011, using simple Wikipedia basemaps and the world-a basemaps you see on AlternateHistory.com Map Threads. However, I was never really satisfied with them, because they always seemed so...stale. Lifeless. After a while, I gave up on them. Then, last year, I picked up the hobby again, not with maps made in Microsoft Paint but in Inkscape, using more detailed techniques to create the beautiful maps I had seen posted on deviantart and AH.com before. I wanted to have maps that told a story, that showed a whole world instead of just a plate imitation of it. In a world where geography is at the bottom of the list for someone's favorite subject, why do you think people make maps of alternate worlds? I would say because, on some level, all people wonder how things would have gone had the circumstances been different. Alternate history is simply quantifying those thoughts and putting them into a study of how you think things could have gone, and maps are simply an extension of that. Not to mention, maps are something just about everyone has been exposed to at one time or another, from atlases to Google Maps, so I think anyone interested in alternate history has thought, at one time or another, of what the maps for different worlds would look like. What programs do you use to create your maps? I started out with, and still primarily use, Inkscape. It's a very sleek, free vector-based program that allows you to use all sorts of tools and tricks to get a map looking just right. It's easily manipulable and fairly easy to learn. Lately, I've experiment with using GIMP to make a base for the map before doing the details in Inkscape. There are definitely some advantages of GIMP, though I'm probably going to start going back to Inkscape more and more. Where can people go if they wanted you to commission a map from you? My deviantart is definitely the best place. I have a journal of all commission prices and info here or you can e-mail me at lzeldadavis at gmail dot com and we can talk prices and such. Any other map makers you would like to recommend? Oh, wow, there's almost too many to list. 1Blomma is definitely one of my favorites and is a master at the craft. There's also a ton more, off the top of my head: martin23230, Fenn-O-Manic, Kurarun, Undevicesimus, Pischinovski, ImDeadPanda, Kuusinen, Sapiento, ReagentAH, RvBOMally, nanwe01, and iselander. All of them are on deviantart, and definitely worth checking out. Any other projects that you are working on now? For alternate history? Well, something like 6 maps that are in some stage of completion, a tutorial, and a whole map series—world map, regional maps, flags, etc.--and that's just the tip of the iceberg. I may go a little overboard. As far as other things, I've got a couple novel ideas in the mix that I might sit down and write one day (alternate history, naturally), but mostly I just like my maps. Definitely my favorite and most soothing hobby. Just like with my maps, I move between books very rapidly, so I'm never reading just one. At the moment, I'm reading In Spite of the Gods: The Rise of Modern India, An Empire of Wealth, Leviathan Wakes and A Canticle for Leibowitz. Like I said, my mind wanders a bit. Any advice for aspiring alternate cartographers? The biggest piece of advice I can give is: be patient. Cartography, whether it's digital or physical, takes time to get right. It can feel like a pain to meticulously trace coastlines, rivers, borders, and the like, but it definitely pays off in the end and makes your map look much nicer. More than half my maps took more than 50 work hours to make, with a couple taking over 100 hours of work time. It can be tedious, but find a rhythm and stick with it and you'll be a master of the craft before you know it.